Schools have started over here, and I feel the first hectic period that always follows the beginning of the school year is over. And that is good. The garden is in dire need of weeding and some replanting. We have got a fence up around part of the garden, and the plants that now are in the running route of Ludde have to be moved, or he will totally destroy them. Fortunately my mother has promised to drop in and give a helping hand. There are some painting jobs in the house, and there are knitting to be done. And now over to the knitting. Let's not dwell over the fact that its months since I last updated, and instead concentrate on the knitting: The fabulous Ribby Cardi by Bonne Marie Burns. 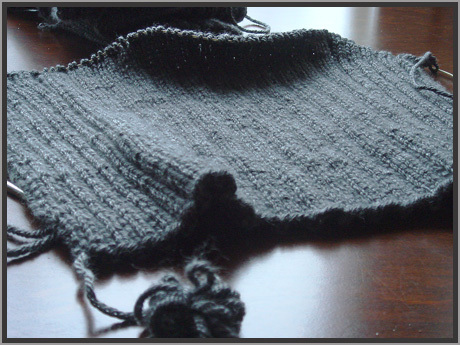 I'm knitting the all ribbed version. 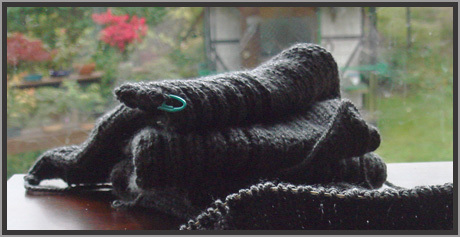 I had 8 balls of beautiful charcoal grey Cashsoft Aran (colour SH 014, dye lot 19D5), and thought it would be enough. Well, it will probably be one ball too little. I have knitted the fronts, and I'm halfway on the back, and it looks a little alarming. I already checked with the shop I bought the yarn from, and they don't have more of it in this dye lot, the dye lot they have has a quite different shine, and is out of question. If I don't relocate one or two balls more, I'll have to decide on another colour for the sleeves, which isn't an impossible idea, even if I had a one coloured Ribby Cardi in mind. I have started a pair of socks in a beautiful aqua blue colour, but I didn't manage to get any good pictures of tat project, so it will have to wait for better light and a post of its own.